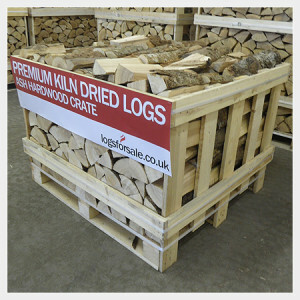 Our neatly stacked small and large crates of kiln dried logs offer the best value. All of our logs are cut exactly to 25cm (10") and are sized for most stoves, consisting of only hardwood logs and nothing else, guaranteed! Over 35% more logs than many of our competitors large crates – with a larger footprint, our crate holds 4 rows of stacked logs.. The equivalent to 2 builders bags. Recommended if you mainly use your stove in the evenings and weekends..
Why is this crate reduced – what am I buying? The logs inside these particular crates were kiln dried for a shorter cycle than usual due to a boiler breakdown in one of the drying chambers within the kiln – the moisture was brought down to an average of 25%-30% but not as dry as our normal specification of below 20%. For this reason, these logs can be burned and mixed with drier logs, or alternatively stored and left outside to dry further over Spring-Summer in preparation for the next season. Some logs may contain exterior mould due to the partial-drying process. 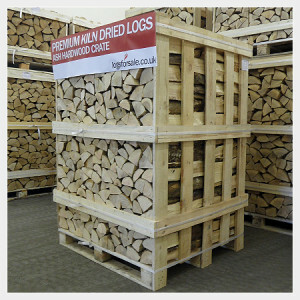 Grade B discount clearance logs - higher moisture than our normal specification. Mix with dryer logs or use next winter..
A great value builders bag filled with logs from our clearance stocks..
A traditional builders bag - a great way to get started with kiln dried logs..
Made in the UK and built to last using high quality, pressure treated tantalised timber with thick boards, our small log store is ideal for storing kiln dried logs outside. The ship-lap roof and all natural wood throughout is what makes our log stores unique – unlike cheaper constructed roofs and stores made from feather edge boards which warp and degrade over time, our roof is constructed from interlocking boards, which are completely airtight and cannot warp. Click here to see the ship-lap roof construction in detail. Rain simply glides off the roof away from your logs and the fully vented back and sides ensures any surface rain simply evaporates off the logs, meaning no need to worry about an increase in moisture content and completely avoiding damp and mold growth. The log store comes flat pack with simple instructions and can be easily assembled in under 10 minutes. The bottom, sides and roof are all pre-constructed – all you need to do is screw the sides in to the base and nail the rear boards on to hold it all together. Screws and nails are provided. As the UK’s leading supplier of premium kiln dried logs, we are in a unique position that enables you to purchase your logs at the same time as your log store, with them all arriving together. To learn more about our kiln dried logs, visit our homepage.